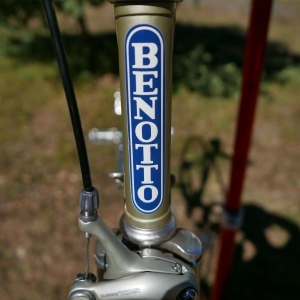 L’Eroica began in 1997 as a cycling tour, or granfondo, in Tuscany, Italy. L’Eroica is a tour along still remaining gravel roads, in Italy called Strade Bianche. The Strade Bianche are legendary because of the professional road bike races along these roads in the 1940’s and 1950’s in which cyclists like Gino Bartali and Fausto Coppi competed. 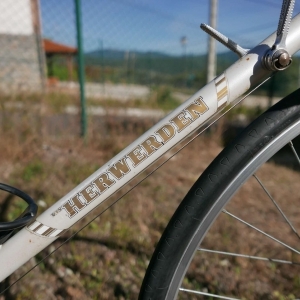 Most participants in L’Eroica ride old road bikes, some call them vintage bikes, from 1987 or older. The bikes are generally equipped with a steel frame, a 10 speed gear (that is 2 x 5 speed!) 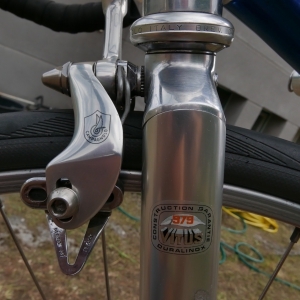 with shift levers on the down tube of the frame, pedals with toe clips and brake cables over the handlebars. 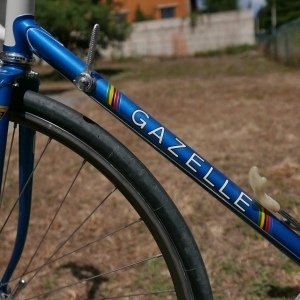 Some participants wear original vintage cycling clothes and shoes, most just settle for vintage replicas. Nowadays Eroica’s are being organised all over the world, in the United States (California), South Africa, Japan, United Kingdom (Brittany), Uruguay (Punta del Este) and The Netherlands (Limburg). Vintage cycling is considered ‘cool’, in many cities young ‘hipsters’ use their vintage road bikes for daily transportation and vintage bike cafés pop-up everywhere. 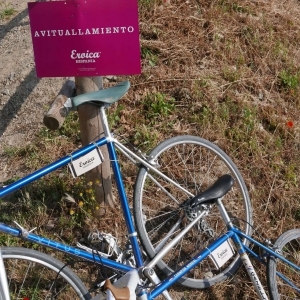 In 2015 the first L’Eroica was organised in Spain, in Cenicero, La Rioja. La Rioja does not have any relevant history in cycling, like Tuscany has, but La Rioja has in common with Tuscany the wine fields and hills. In 2015 I could not participate in L’Eroica Hispania, but in 2016 I bought and prepared 4 old road bikes in the Netherlands and I brought them to Spain. In June 2016, together with three Dutch ‘bike buddies’, I rode my first Eroica. There is more information about L’Eroica Hispania on the L’Eroica Hispania Website and on their Facebook. There is also an extensive report from an American participant on the 2014 La Rioja Bike Race on the Nor’Easter Backcountry blog.